“Come, come, come!” shouts Royan Stone, clapping his hands together like he’s calling a dog. But the object of his interest is something much more menacing — a crocodile sunning itself on the banks of Jamaica’s Great Morass. A veteran wildlife guide, Stone tosses raw chicken into the water between our boat and the golden-eyed croc. No reaction at first. And then snap! as the reptile lunges for its snack. Flanking the lower reaches of the Black River, the morass is the Caribbean’s largest and most bio-diverse wetland. Several outfitters offer guided boat trips of the Great Morass, including Irie Safari, which provides pontoon boat cruises and kayak adventures ranging from three to six hours. In addition to Jamaica’s second longest river, the sprawling 125-square-mile swamp comprises freshwater marshes and brackish lagoons, mudflats and mangrove thickets, as well as tiny limestone islands that harbor forested areas. Scattered around the edges are isolated villages and farms that seem lost in time. The warren of tropical waterways is also home to more than a hundred bird species, including osprey, egrets, herons, the rare West Indian whistling duck, the Caribbean coot, and even migrating flamingos. Tarpon, snook, and snapper are among the many fish species. The rare Caribbean manatee is known to linger around the river mouth. And the hot pepper shrimp sold in the roadside stalls of Middle Quarters — on the swamp’s western edge — thrive in the morass. 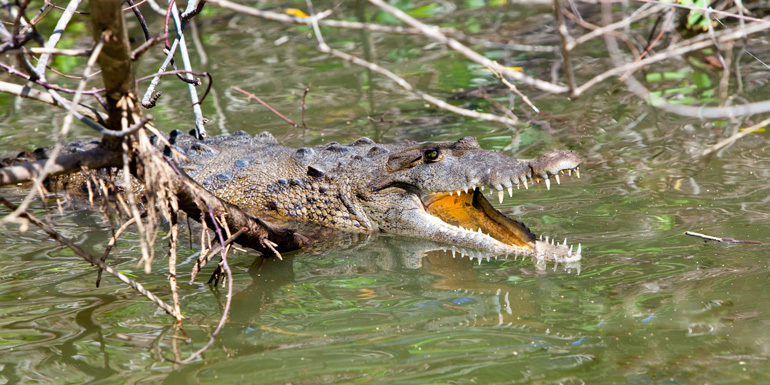 At the top of the food chain is the American crocodile (Crocodylus acutus). One of the larger croc species, males can reach up to 20 feet and are considered much more demure than alligators or their old-world cousins in Africa and Australia. “But they can get aggressive if you bother them,” Stone admits. Tour packages normally include transportation to and from the Montego Bay cruise terminal, but you can also hire a taxi or drive yourself to the safari wharf in Black River town. Riverside Drive, Black River, Jamaica, 876.965.2211, lostriverkayak.com. What do you like to do in Montego Bay?